Copyright ©2013 Baishideng. All rights reserved. Author contributions: Michiels JJ wrote the manuscript, discovered the platelet-mediated microvascular disturbances in thrombocythemia and conducted the studies on the etiology of platelet thrombophilia in thrombocythemia; Ten Kate FWJ performed the pathology study on skin biopsies from erythromelalgic areas and bone marrow histology for detection of early stage essential thrombocythemia and polycythemia vera; Van Genderen PJJ performed the platelet kinetic, platelet function and coagulation studies; Koudstaal PJ analyzed and interpreted the neurological, ocular and visual manifestations as part of the broad spectrum of aspirin responsive microvascular disturbances in thrombocythemia. Essential thrombocythemia (ET) and polycythemia vera (PV) frequently present with erythromelalgia and acrocyanotic complications, migraine-like microvascular cerebral and ocular transient ischemic attacks (MIAs) and/or acute coronary disease. The spectrum of MIAs in ET range from poorly localized symptoms of transient unsteadiness, dysarthria and scintillating scotoma to focal symptoms of transient monocular blindness, transient mono- or hemiparesis or both. The attacks all have a sudden onset, occur sequentially rather than simultaneously, last for a few seconds to several minutes and are usually associated with a dull, pulsatile or migraine-like headache. Increased hematocrit and blood viscosity in PV patients aggravate the microvascular ischemic syndrome of thrombocythemia to major arterial and venous thrombotic complications. Phlebotomy to correct hematocrit to normal in PV significantly reduces major arterial and venous thrombotic complications, but fails to prevent the platelet-mediated erythromelalgia and MIAs. Complete long-term relief of the erythromelalgic microvascular disturbances, MIAs and major thrombosis in ET and PV patients can be obtained with low dose aspirin and platelet reduction to normal, but not with anticoagulation. Skin punch biopsies from the erythromelalgic area show fibromuscular intimal proliferation of arterioles complicated by occlusive platelet-rich thrombi leading to acrocyanotic ischemia. Symptomatic ET patients with erythromelalgic microvascular disturbances have shortened platelet survival, increased platelet activation markers β-thromboglobulin (β-TG), platelet factor 4 (PF4) and thrombomoduline (TM), increased urinary thromboxane B2 (TXB2) excretion, and no activation of the coagulation markers thrombin fragments F1+2 and fibrin degradation products. Inhibition of platelet cyclooxygenase (COX1) by aspirin is followed by the disappearance and no recurrence of microvascular disturbances, increase in platelet number, correction of the shortened platelet survival times to normal, and reduction of increased plasma levels of β-TG, PF4, TM and urinary TXB2 excretion to normal. These results indicate that platelet-mediated fibromuscular intimal proliferation and platelet-rich thrombi in the peripheral, cerebral and coronary end-arterial microvasculature are responsible for the erythromelalgic ischemic complications, MIAs and splanchnic vein thrombosis. Baseline platelet P-selectin levels and arachidonic acid induced COX1 mediated platelet activation showed a highly significant increase of platelet P-selectin expression (not seen in ADP and collagen stimulated platelets), which was significantly higher in JAK2V617F mutated compared to JAK2 wild type ET. Dameshek et al observed specific clinical features at the time of presentation in 20 newly diagnosed polycythemia vera (PV) patients seen between 1928 and 1937, 75 years ago. The spectrum of clinical manifestations were headache, usually quite severe, in 17; attacks of migraine in 3; vertigo in 14; visual disturbances, particularly spots before the eyes and colored scotomas in 6; paresthesias, numbing and tingling in toes and fingers in 12, circulatory disturbances of the legs, feet or hands in 6; and various types of major thromboses (cerebral, coronary, venous, arterial) in 9 cases. Many cases were never correctly diagnosed but masqueraded under the diagnosis of various types of peripheral vascular disease, including thromboangiitis obliterans (Burger’s disease), atypical erythromelalgia, hypertension, symptoms referable to several organ systems or atypical symptoms difficult to classify. Since the sensations of pain, warmth and tingling of the legs are common to both polycythemia and the rather poorly defined disorder of erythromelalgia (Brown), the possibility of polycythemia should be suspected when the diagnosis of erythromelalgia is made or suspected. Dameshek et al noted that the lack of large vessel involvement in PV and the extremely high platelet counts suggested the possibility of “platelet polycythemia” or “thrombophilia” with multiple small peripheral vascular thromboses. Aspirin sensitive erythromelalgia is characterized by warm, red, congested extremities and painful burning sensations and causally linked to thrombocythemia in various myeloproliferative disorders (MPD), typically occur in patients with essential thrombocythemia (ET) and PV and has never been observed in patients with reactive thrombocytosis[2-6]. Acroparesthesias characterized by tingling, pins and needles sensations and numbness in the toes or fingers usually precede the disabling red, swollen, burning distress. Warmth intensifies the discomfort and cold provides relief. The burning distress is always associated with local warmth, swelling with mottled redness and blue spots. Intense burning, throbbing and aching with peeling of the skin of the affected toes or fingers that become cold, black and ischemic come at a more advanced stage[7-12]. If left untreated, digital acrocyanotic ischemia and gangrene of toes and fingertips do occur. Smith et al first described that aspirin promptly relieved erythromelalgic pain for approximately 3 d. This long-lasting effect of a single dose of aspirin is so specific for erythromelalgia that it can be used as a diagnostic criterion[3-6]. If left untreated, erythromelalgia usually leads to painful acrocyanosis and gangrene of one or more toes or tips of the finger[4-12]. When erythromelalgia progresses to ischemic acrocyanosis or gangrene of a toe or fingertip, the peripheral arterial pulsations are usually normal. Anticoagulation with coumarin in cases with erythromelalgia complicated by digital necrosis had no therapeutic effect, whereas subsequent treatment with aspirin 500 mg/d not only relieved the erythromelalgic pain, but also markedly improved the digital ischemic circulation disturbances (thromboangiits obliterans)[4,5]. The long-lasting relief of erythromelalgia for several days in ET and PV patients by one dose of aspirin 500 mg is correlated with inhibition of ADP, epinephrine or collagen induced platelet aggregation that persists for several days. This is the result of irreversible inhibition of platelet cyclooxygenase (COX1), as can be measured by the malondialdehyde (MDA) in platelet rich plasma (PRP)[5,6,13-19]. N-ethylmaleimide added to PRP maximizes the arachidonic COX1 pathway to form unstable prostaglandin endoperoxides intermediates, thromboxane A2 (TXA2) and its stable end products, thromboxane B2 (TXB2) and MDA. The analgesics sodium salicylate, glafenin, paracetamol and acetaminophen, as well as the platelet inhibiting agents dipyridamole and sulfinpyrazone, in adequate dosages for at least 1 wk had no appreciable effect on erythromelalgia or platelet COX1 activity as measured by MDA production in PRP[4-6]. Erythromelalgia in ET and PV is caused by platelet mediated arteriolar thrombosis and inflammation that can only be relieved by selective inhibition of platelet COX1[4,5]. This platelet-mediated thrombotic disease (platelet thrombophilia) in the end-arterial circulation of thrombocythemia (ET and PV) patients, first described by Michiels et al, is confirmed by the Rotterdam MPD Study Group in a series of prospective histopathological, platelet kinetic, experimental and aspirin intervention studies in symptomatic and asymptomatic ET patients[20-36]. Very little was known about the histopathology of erythromelalgia in thrombocythemia as the opportunity to examine tissue from the involved extremities was not available in the literature. From 1977 to 1981, Michiels (Departments of Hematology and Pathology, Erasmus University, Rotterdam) performed skin punch biopsies from erythromelalgic areas in thrombocythemia patients. Histopathological studies from skin areas of erythromelalgia in ET and PV patients revealed characterization by specific arteriolar vascular changes in the reticular dermis, usually without involvement of venules, capillaries or nerves[4,5,20,21]. In recently relapsed erythromelalgia, endothelial cells are swollen with large nuclei and the vessel lumen is narrowed by proliferation of smooth muscle cells with vacuolization and swelling of the cytoplasm and deposits of intracellular material[4,5,20]. 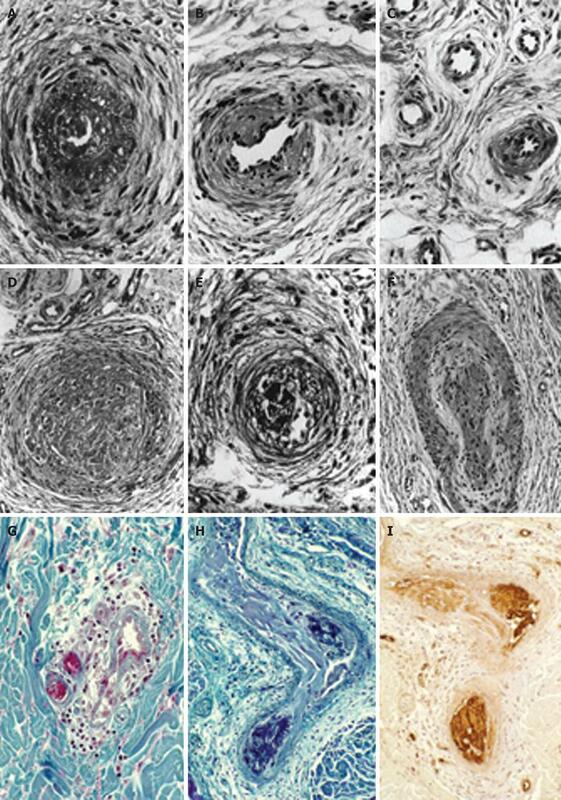 The internal elastic lamina appears to be split between proliferated smooth muscle cells, giving rise to the appearance of fibromuscular intimal proliferation. The arterioles with proliferative thickening of their walls may be occluded by fresh thrombi if left untreated. Ultimately, the arterioles may become completely fibrosed. Specific immunohistochemical staining of skin biopsies from recently relapsed erythromelalgic cyanotic skin areas showed fresh thrombi occluding these arterioles, which stained strongly for von Willebrand factor (vWF), opposed to only a weak staining for fibrin, indicating a platelet-rich thrombus (Michiels et al[4,5], van Genderen et al, Figure 1). Michiels conceptualized that the symptoms of platelet-mediated erythromelalgia, including migraine-like cerebral ischemic attacks and visual disturbances, are the result of platelet activation and aggregation in vivo, which preferentially takes place in the arterioles[5,20]. The high shear rate of the blood flow in the end-arterial circulation very likely contributes to this localization of platelet mediated arteriolar thrombosis and inflammation in thrombocythemia[4,5,20]. In this process of intravascular platelet activation and aggregation, vasoactive substances like prostaglandins and other factors released by activated and leukocytes account for the inflammatory symptoms and platelet derived growth factor (PDGF) for the fibromuscular intimal proliferation of arterioles in erythromelalgic areas (Figures 2 and 3). Intravascular platelet aggregates or thrombi clearly lead to acrocyanotic microvascular occlusions. If left untreated, erythromelalgia will lead to irreversible end arterial occlusion and gangrene of toes (diagnosed as thromboangiitis obliterans by Dameshek et al) or fingertips (Figure 3). Figure 1 The histopathological appearances of a skin punch biopsy from areas of recently relapsed erythromelalgia 1 wk after aspirin discontinuation arteriolar l fibromuscular intimal proliferation, swollen endothelial cells, slight intravascular and perivascular infiltration with inflammatory cells, some perivascular fibrosis and no occlusive arteriolar thrombi. The histopathological appearances from relapsed erythromelalgia complicated by blue ischemic spots 3 wk after aspirin discontinuation show arterioles with pronounced fibromuscular intimal proliferation without occlusive trombi (A-C) and fibromuscular intimal proliferation with occlusive thrombotic arteriolar lesions (D-F) perivascular oedema, vascular and perivascular fibrosis and infiltration by inflammatory cells (thromboangiitis obliterans). Originated from Michiels et al. Biopsy from red-bluish discolored erythromelalgic skin area showing arteriolarthrombi with a weak fibrin staining (H) as compared to a positive fibrin staining from a patient with primary antipholipid syndrome and recurrent arterial skin thromboses (G). The occlusive arteriolar thrombi revealed a strong staining for von Willebrand factor (I) indicating platelet rich thrombi. This documents that thrombi from skin areas of erythromelalgia complicated by acrocyanosis are indeed platelet-rich and fibrin-poor thrombi. Originated from van Genderen et al. Figure 2 β-thromboglobuline levels in healthy control, and in essential thrombocythemia (E) either asymptomatic (E-), complicated by erythromelalgia (E+) and after treatment of E+ with aspirin (E+ → E-). 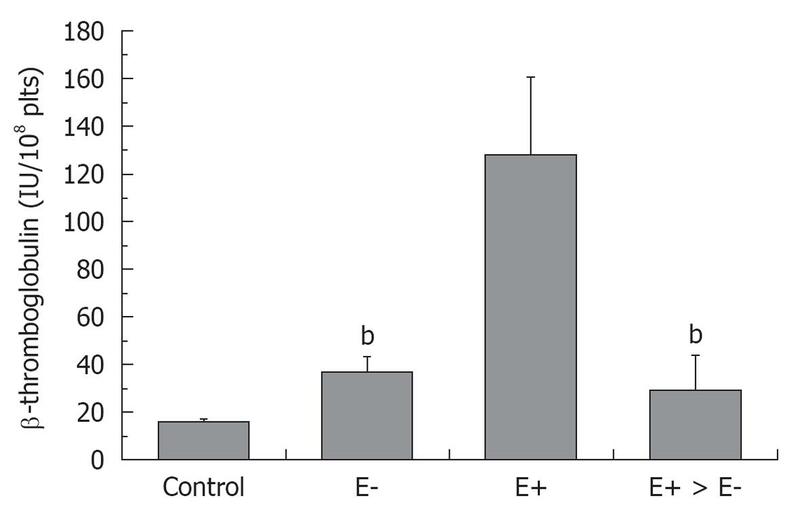 bP < 0.01, significant differences between E- and E+ > E- as compared to E+. Figure 3 Etiology and pathophpysiology of platelet-mediated fibromuscular intimal proliferation and platelet thrombi in erythromelalgia and its acrocyanotic complications in thrombocythemia vera (essential thrombocythemia and polycythemia vera) and etiology of major thrombosis on top of erythromelagic microvascular circulation disturbances in polycythemia vera. To further demonstrate the involvement of platelets in the pathogenesis of erythromelalgic acrocyanosis of ET patients, we performed prospective platelet kinetic studies using Cr-labeled autologous platelets in 10 asymptomatic and in 10 symptomatic thrombocythemia patients complicated by erythromelalgia and in a control group of 6 cases of reactive thrombocytosis (Table 1). Platelet survival times were significantly shortened (4.2 ± 0.4 d) in symptomatic thrombocythemia complicated by erythromelalgia compared with asymptomatic thrombocythemia patients (6.6 ± 0.3 d, P < 0.001) and patients with reactive thrombocytosis (8.0 ± 0.4 d, P < 0.001). After treatment of erythromelalgia with aspirin 500 mg per day in 7 symptomatic thrombocythemia patients, platelet survival increased significantly from 4.0 ± 0.3 to 6.9 ± 0.4 d (P < 0.001), thereby causing a significant rise in the platelet count of about 200 × 109/L in each of the aspirin treated thrombocythemia patients (Table 1). Coumadin failed to improve platelet survival or symptoms of erythromelalgia in 2 thrombocythemia patients. This clearly documents the active involvement and causative role of platelets in the etiology of erythromelalgia [and very likely also transient ischemic attacks (TIAs)] as a pathognomonic microvascular thrombosis (platelet thrombophilia) in ET and PV patients (Figures 1 and 3). Table 1 A Platelet kinetic, hemostatic and thromboxane B2 studies in normal individuals (control), asymptomatic essential thrombocythemia patients (E-), essential thrombocythemia patients suffering from erythromelalgia (E+) and the effect of acetylsalicylic acid (aspirin) in E+ patients. 1Significant difference. Data are expressed as mean ± SE. PF4: Platelet factor 4; β-TG: β-thromboglobulin; F1+2: Prothrombin fragment 1 + 2; FDP: Fibrin degradation products; ET: Essential thrombocythemia; E+: Erythromelalgia present; E-: Erythromelalgia absent. Originated from[22,24]. Bellucci et al showed that increased levels of plasma β-thromboglobulin (β-TG) in 16 asymptomatic ET persisted if the platelet count normalized by cytostatic reduction of the platelet count. In this study, increased β-TG levels were interpreted as platelet activation and endothelial cell damage may be present since thrombomoduline (TM) levels tended to be increased in ET patients. van Genderen et al performed a prospective intervention study and measured plasma β-TG and platelet factor 4 (PF4) as markers of platelet activation, TM as a marker for endothelial cell activation, and activation markers of coagulation including prothrombin fragments (F1+2) and fibrin degradation products in controls, asymptomatic ET and symptomatic ET complicated by erythromelalgia. 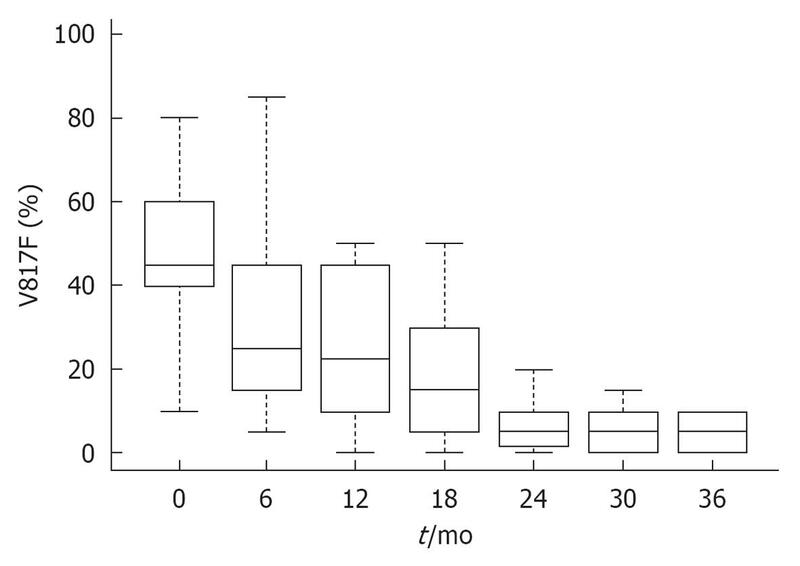 Compared to 20 controls, PF4 and β-TG levels were significant higher in 16 asymptomatic ET patients (Table 1, Figure 2). Compared with 16 asymptomatic ET patients and 20 control subjects, erythromelalgia in 5 symptomatic ET patients was characterized by significant and much higher β-TG and TM levels, but no significant differences were detected in either F1+2 or FDP levels (Table 1, Figure 2). Treatment of erythromelalgia with aspirin (500 mg for at least 7 d) resulted in the disappearance of erythromelalgic signs and symptoms, which was paralleled by a significant increase in platelet count and a significant decrease in β-TG and TM levels (Table 1, Figure 2). From the increase in plasma levels of β-TG and TM and its correction by aspirin, we concluded that increased interactions of activated hypersensitive platelets and endothelial cells do occur as the initiating process of fibromuscular intimal proliferation seen in the very early stage of platelet-mediated inflammatory symptoms of erythromelalgia (Figures 1 and 3). The generation of thrombin appears not to be essential for the etiology and subsequent formation of platelet-rich thrombi in erythromelalgic acrocyanosis (platelet thrombophilia), thereby giving a plausible explanation for the inefficacy of coumadin-derivatives (vitamin K antagonists) and heparin in the prevention and treatment of erythromelalgia in ET and PV patients. In a collaborative study, Wehmeier, Schroer and Michiels (Duesseldorff-Rotterdam) prospectively investigated the effect of anagrelide on clinical symptoms and in vivo platelet activation, as measured by plasma levels of TXB2 and PDGF in 17 ET patients, while on no treatment and after correction of platelet count by anagrelide treatment (unpublished data 2000). The mean value of plasma PDGF levels in 17 untreated ET patients (4.8 ng/mL) was significantly higher compared to normal controls (2.77 ng/mL, range 0.99-4.66 ng/mL, P = 0.0005) and returned to normal (2.13 ng/mL) during anagrelide treatment. Twelve of 17 (70%) untreated ET patients had plasma PDGF levels above the upper limit of normal. The plasma PDGF level was still above normal in 1 case of ET during anagrelide treatment. The mean value of plasma PDGF expressed in ng per 105 platelets (ng/105 pL) was significantly lower in the untreated ET patients (0.48 ng/105 pL) compared to normal controls (0.92 ng/105 pL) and increased to a level (0.60 ng/105 mL) during anagrelide treatment, which is not significantly different from controls. The increased plasma level and decreased platelet content of PDGF may indicate that circulating activated platelets in untreated ET had released some of their PDGF content[5,20]. The mean value of plasma TXB2 levels in 17 untreated ET patients was 22-fold higher (13.8 ng/mL) and significantly increased compared to normal controls (0.63 ng/mL, range 0.34-0.97 ng/mL, P = 0.0002). This very high mean value of plasma TXB2 significantly decreased to 3.2 ng/mL (P = 0.004) during anagrelide treatment, which is still significantly above the normal values of 0.63 ng/mL (P = 0.04). The mean value of plasma TXB2 expressed in ng per 105 platelets (ng/105 pL) was 4-fold and significantly higher (1.0 ng/105 pL) in the untreated ET patients compared to normal controls (0.25 ng/105 pL, P = 0.04). The mean value of plasma TXB2 (0.86 ng/105 pL) was significantly lower in 17 ET patients during anagrelide treatment compared to the period of no treatment, but still remained 3.4-fold and significantly higher compared to normal controls (0.25 ng/105 pL, P = 0.008). Unequivocal convincing evidence for platelet activation in vivo during erythromelalgic attacks is provided by measuring platelet-specific proteins or stable degradation products of platelet-derived TXB2 excretion in urine[25-28]. The endogenous synthesis of TXA2 by platelets, estimated by the measurement of their main stable TXB2 metabolites in urine, was found to be increased in ET and PV patients[29,30]. The increased biosynthesis of platelet derived TXB2, as measured by urinary excretion of TXB2 in ET and PV patients, may reflect spontaneous platelet activation in vivo. As the erythromelalgic microvascular thrombotic predisposition in ET is the consequence of the thromboxane-mediated routes of platelet activation, a prospective intervention study was designed to demonstrate whether increased urinary TXB2 excretion as a reflection of increased platelet thromboxane formation precedes the occurrence of microvascular thrombosis in ET patients complicated by erythromelalgia after discontinuation of aspirin. Within 10 d after discontinuation of aspirin, 3 ET patients developed arterial microvascular thrombosis of the extremities (erythromelalgia), which was preceded by a 3 to 30 fold increase in urinary TXB2 end products excretion (1100 to 15000 pg/mg creatinine) compared with 3 ET patients (100 to 800 pg/mg creatinine), who remained asymptomatic after discontinuation of aspirin. The increased urinary TXB2 end products excretion and the clinical signs of erythromelalgia could be inhibited to normal (50 to 300 pg/mL creatinine) by a platelet-specific low dose aspirin regimen of 50 mg daily without affecting vascular endothelial cyclooxygenase. These observations clearly indicate that activated platelets in the end-arterial circulation are the main source of increased TXB2 generation in symptomatic ET patients complicated by erythromelalgia, which provides the rationale of a very low dose of aspirin 50 mg daily or 100 mg every other day for the prevention of microvascular circulation disturbances in symptomatic thrombocythemia patients with ET or PV. From 1978 to 1993, we documented 59 consecutive cases of ET and 26 cases of PV associated with thrombocythemia. The specific manifestations in 55 symptomatic cases were erythromelalgia and its acrocyanotic ischemic complications in 43, TIAs in 23 and coronary artery disease in 9 patients and 30 were asymptomatic. Of the 23 patients with TIAs, six out of 26 (23%) had PV and 17 out of 59 (29%) ET. The spectrum of TIAs and visual disturbances in these 17 ET patients in our first report (Table 2, Michiels et al) has been described and interpreted by the neurologist Dr. Koudstaal (Department of Neurology, Erasmus University Medical Center, Rotterdam). Erythromelalgia (E), visual symptoms (VS) and/or angina pectoris (AP) followed or preceded the microvascular cerebral symptoms (CS in Table 2). These cerebral and visual ischemic symptoms are interpreted by the vascular neurologist Dr. Peter Koudstaal (Table 2) in 1993 and by the neurologists Koudstaal et al (Table 3) as migraine-like microvascular cerebral ischemic attacks (MIAs, Tables 2 and 4). Risk factors for vascular disease were present in only 2 and the peripheral arterial pulses were normal in all. Screening with brain computed tomography (CT), carotid duplex ultrasonography and extensive cardiac investigations at the time of MIA or visual disturbances in all 17 patients did not reveal any obvious co-existent cause of the microvascular ischemic event in any patient. In two studies of 22 ET patients, the spectrum of MIAs revealed a specific pattern different from TIAs in atherothrombotic disease: 11 had focal symptoms (transient monocular blindness in 3, transient mono- or hemiparesis in 6 and both of these in 1, migraine accompaniments in 1 and partial stroke in 1) and nonfocal symptoms occurred in 14 (transient postural instability in 13, dysarthria in 8 and scintillating scotomas in 5). These transient focal and nonfocal neurological and VS all had a sudden onset, occurred with a march rather than all at one time, lasted for a few seconds to several minutes and were usually associated with or followed by a dull or pulsatile headache[33,34]. This clinical presentation of MIAs show a striking similarity with migraine accompaniments and supports the crucial role of platelets in the pathogenesis of migraine-like MIAs in ET (Figure 3). Fourteen evaluable ET patients with MIAs remained asymptomatic while treated with aspirin (250 to 500 mg daily) for 1 to 9 years with increased platelet counts between 520 to 1250 × 109/L. Recently, Billot et al prospectively studied the neurological disorders in 37 ET patients, of whom 11 (30%) presented with neurological symptoms. Among them, 4 had thrombotic events (TIA in 3, cerebral venous thrombosis in 1), 7 complained of transient or fluctuating subjective symptoms, including cephalgia, dizziness, instability, visual disturbances and transient loss of consciousness (MIAs). Brain magnetic resonance imagery failed to detect any substratum with subjective symptoms. JAK2V617F mutation was found in 9 of 11 patients with neurological symptoms vs 14 of 26 ET patients without symptoms. In a recent study, we observed similar MIAs due to disturbances of the cerebral or ocular microcirculation as the main presenting feature in 10 JAK2V617F positive patients with early myeloproliferative disease ET in 6 and PV in 4. The ages of the patients at the time of first symptoms and increased platelet count ranged from 21 to 53 years for ET and from 39 to 50 years for PV. The MIAs in these 10 JAK2V617F mutated MPN patients ranged from attacks of transient blindness, diplopia and scotomas to migraine-like attacks followed by throbbing headaches, nausea, vomiting or even seizures. The time lapse between the first symptoms of MIAs and the delay in diagnosis of ET in 5 patients ranged from 4 to 12 years, indicating that its causal relationship with early stage JAK2V617F mutated in ET and PV are in most cases still overlooked because of unfamiliarity with the typical clinical appearances and the absence of any abnormality on a cerebral CT scan. Table 2 Clinical manifestations and sequence of aspirin-responsive microvascular cerebral ischemic attacks in each of 17 patients with essential thrombocythemia. Because of ignorance of a causal relationship between microvascular cerebral ischemic attacks and essential thrombocythemia by the referring doctors, the time lapses between sequential microthrombotic events were prolonged ranging from 1 to 7 years. MI: Myocardial infarction; CS: Cerebral symptoms; VS: Visual symptoms; AP: Angina pectoris; E: Erythromelalgia. Number of attacks: F: Few; S: Several 4-10; M: More than 10. Source Michiels et al. Table 3 Incidence of thrombotic and bleeding complications in the prospective 1975-1996 Rotterdam study of 68 essential thrombocythemia patients during a median follow-up of 6.7 years according to treatment strategy n (events/100 persons per year). Table 4 Nature of neurological and visual, aspirin responsive migraine-like microvascular cerebral ischemic attacks in 56 reported cases of essential thrombocythemia n (%). ET: Essential thrombocythemia; TIAs: Transient ischemic attacks. Originated from[33,35,37]. The neurologists Koudstaal et al reviewed the literature and analyzed the spectrum of erythromelalgia and MIAs in 56 patients with ET in 4 studies[33,35,37,38], of which the nature of neurological and VS are shown in Table 4. Fröhli et al documented the prophylactic efficacy of aspirin on vascular complications in 22 patients with ET (n = 9) or thrombocythemia associated with PV in remission after bloodletting (n = 13) at platelet counts between 400 to 1000 × 109/L. Aspirin (250 mg/d) in 22 symptomatic patients during a total period of 45 patient-years resulted in the disappearance of digital microvascular ischemia in 11 and of MIAs, including unstable gait, dizziness and blurred vision, which were completely abolished in 12 patients. Discontinuation of aspirin was followed by prompt recurrence of the microvascular circulation disturbances. Scheffer et al analyzed our 9 cases of coronary events as the presenting symptom of ET (Department of Cardiology, Erasmus University, Rotterdam), including myocardial infarction in 4 and unstable AP in 5. The 5 ET patients with unstable angina had coronary disease (one vessel disease in 2 and two vessel disease in 3) underwent coronary bypass surgery. During continuous treatment with low doses of aspirin (500 mg/d) there was no recurrence of vascular events in 4 patients for 1 to 5 years at platelet counts of 650, 800, 860 and 1000 × 109/L. Five patients in maintained complete remission of ET (platelet counts < 350 × 109/L) for more than 1 to 6 years after treatment with busulphan remained asymptomatic. 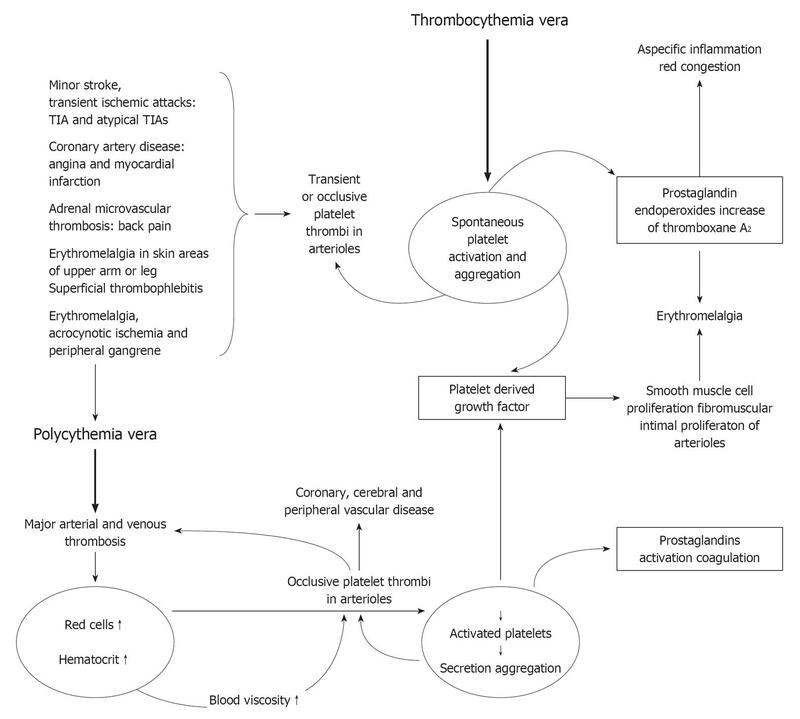 The concept of platelet-mediated inflammatory and thrombotic processes in the end-arterial circulation of the brains, heart, adrenal, skin and extremities in thrombocythemia vera is completely in line with the recent demonstration of in vivo activation of platelets, leukocytes and endothelial cells in ET and PV patients (Figure 3)[23,24,29,30,32]. The increased risk of erythromelalgic microvascular and major arterial thrombosis in ET and PV is associated with in vivo activation of leukocytes (increased CD11) expression and leukocyte alkaline phosphatase (LAP) score, together with increased plasma markers indicating platelet activation, proteolysis of high vWF multimers and endothelial damage[24,41,42]. Increased CD62 and CD63 antigens and levels of soluble vascular adhesion molecule 1 (sVCAM-1) reflecting in vivo platelet activation has been demonstrated in 52 patients with ET and PV, both before and after cytoreductive treatment compared with 22 healthy controls. In these 52 ET and PV patients, sVCAM-1 expression was increased before and after treatment compared with 22 healthy controls and 17 non-thrombocythemic patients with acute cerebrovascular ischemia and normal platelet counts. Cella et al found increased levels of soluble P-, E- and L-lectins in PV and ET patients compared to controls. In particular, PV patients showed higher levels of P-selectin as well as E-lectin, both possibly released from activated endothelium cells (EC) as the consequence of increased platelet-EC interactions, resulting in increased TM levels. These findings indicate that spontaneous in vivo platelet activation in MPD patients not on aspirin in ET and PV result in endothelial damage, probably through release of angiogenic factors and in vivo activation of platelets and leukocytes[41,42]. All PV and the majority of our symptomatic ET patients [erythromelalgic thrombotic thrombocythemia (ETT)] have high LAP scores. Westwood et al and Johansson et al found low serum erythropoietin (EPO) levels and EPO independent erythroid colony formation (EEC+) in about half of the ET patients. According to Tom Pearson, such cases of EEC+ ET with low serum EPO levels are to be regarded as prodromal PV patients[46,47]. It became evident from 2005 that the majority of EEC+ ET patients with low serum EPO carry the JAK2V617F mutation. EEC-positive ET is associated with a higher risk of developing microvascular and major thrombotic complications compared to EEC-negative ET[45,49]. Early or initial (prodromal) PV, according to ECP criteria defined by Michiels et al[50,51] between 2002 and 2004 (http://www.mpn-stichting.nl/doctors_brochure_2004.pdf ), is typically featured by a PV picture in the bone marrow, has positive results for EEC, low serum EPO levels, slightly increased values for hematocrit up to 0.50, and a much higher thrombotic risk compared to EEC-negative ET[45,48-51]. Falanga et al showed in 2000 that patients with ET (n = 37) and PV (n = 34) have increased peripheral blood mononuclear cell (PMN) activation parameters (PMN membrane CD11b and LAP antigen expression, cellular elastase content, plasma elastase and myeloperoxidase levels) evaluated simultaneously with the levels of plasma markers of endothelial damage (thrombomodulin and vWF antigen) and hypercoagulation (thrombin-antithrombin complex, prothrombin fragment 1 + 2 and D-dimer). These data nicely confirm our findings that ET and PV are at increased risk for platelet-mediated thrombosis, which is associated with in vivo platelet, leukocyte and EC activation and associated with laboratory signs of coagulation system activation as well. Falanga et al further studied 37 ET patients with JAK2V617F mutation, 38 JAK2 wild type ET and 50 healthy controls. Leukocytes, PMN counts and platelets from overall ET patients, compared to controls, expressed significantly higher membrane tissue factor (TF) and P-selectin (P < 0.01 = activation marker) and lower platelet surface markers CD41 and CD42b (P > 0.01 very likely down regulated after activation). 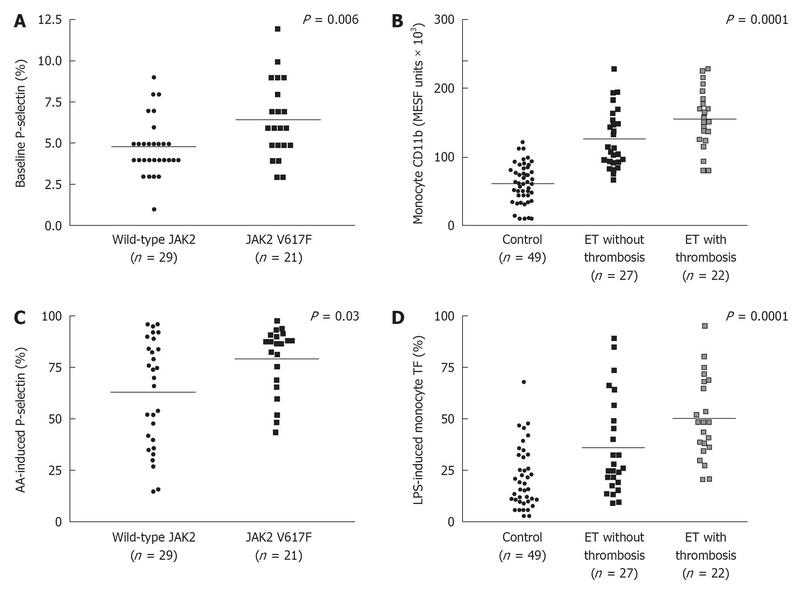 TF antigen levels and membrane TF appeared significantly higher in the V617F JAK2 carriers compared to JAK2 wild-type[52,53]. The presence of circulating platelet/PMN aggregates was significantly greater in the JAK2-mutation carriers than in JAK2 wild-type ET and controls (P < 0.05). PMN surface activation and inflammatory markers, i.e., CD14, TF, CD11b, and LAP-scores, were all significantly higher in ET vs control subjects, with CD14 and LAP being the highest in ET carrying the JAK2V617F mutation. Finally, a significant increase in plasma hypercoagulation markers was found in ET patients and the only difference was higher plasma thrombomodulin levels in ET carrying the JAK2V617F mutation, reflecting subclinical increased platelet-endothelial cell interactions (P < 0.01)[52,53]. Cervantes and his team performed a very interesting study on increased platelet and leukocyte activation in 22 ET patients with thrombosis, including erythromelalgia, TIA, stroke, myocardial infarction, 27 ET patients without thrombosis and in 49 controls. The majority of the 49 ET patients received myelosuppressive therapy (hydroxyurea, anagrelide or P32) in 95% of ET with thrombosis and in 83% of ET without thrombosis. Only 33% and 15% of ET patients with and without thrombosis used aspirin. The key findings are the following. Firstly, baseline platelet P-selectin levels are higher in ET compared to controls. Secondly, arachidonic acid (AA) is transformed by platelet COX1 into prostaglandin metabolites, including TXA2 (a potent platelet activator), and AA-induced platelet aggregation induced a highly significant increase of platelet P-selectin expression [P≥ 0.0001, which is not seen in ADP and collagen stimulated platelets (Figure 4)]. Both baseline and AA induced platelet P-selectin expressions were significantly higher in JAK2V617F mutated ET compared to JAK2 wild type ET. These observations are completely in line with the existence of hyper-reactive platelets in ET and PV caused by the JAK2V617F gain of function mutation. Monocyte CD11b expression and PLS-induced monocyte TF expression is the highest in ET with thrombosis (Figure 4). Cervantes and his team did not study untreated symptomatic ET patients at the time of presentation and the effect of aspirin treatment alone and the effect of aspirin on top of myeloproliferative treatment in JAK2V616F mutated and JAK2 wild type ET. Such prospective studies need to be done to differentiate between the role of platelets and the contribution of leukocyte activation in platelet and leukocyte mediated inflammatory and thrombotic processes. The sustained relief of erythromelalgia and MIAs by aspirin is correlated with inhibition of ADP, epinephrine, collagen and AA-induced platelet aggregation, which is the result of irreversible inhibition of platelet COX1, as can be measured by the MDA in PRP[5,6,13-19]. Ticlopedine (and also clopidogrel, prasugrel) inhibits the ADP platelet membrane receptor but not the AA induced platelet COX1 activation. This is the reason why platelet ADP receptor inhibitors (ticlopedine, clopidogrel, prasugrel) are shown by us as ineffective for the cure and prevention of platelet mediated microvascular disturbances in ET[5,31]. It is predicted that aspirin, but not ADP-receptor inhibitors, will suppress the AA-induced platelet P-selectin expression and that aspirin will not affect the increased monocyte CD11b expression and the LPS induced monocyte TF expression. This hypothesis is drawn from our clinical observation that aspirin does not affect the increased LAP-score and does not affect symptoms like pruritus, which is much more prevalent in JAK2V617F hetero/homozygous mutated PV than in heterozygous JAK2V617F mutated ET. A key experiment may be to assess both platelet and leukocyte activation markers in those JAK2V617F mutated prodromal and overt PV patients before and after a warm shower that elicits pruritus. Figure 4 Baseline P-selectin levels (A), and arachidonic acid-induced P-selectin levels (C) in JAK2V617F mutated essential thrombocythemia and JAK2 wild type essential thrombocythemia; monocyte CD11b (B), and LPS-induced monocyte tissue factor expressions (D) in controls, essential thrombocythemia without thrombosis and essential thrombocythemia with thrombosis. Majority of essential thrombocythemia (ET) patients were on myelosuppressive therapy (mainly hydroxyurea), and a minority used aspirin at time of laboratory investigations. AA: Arachidonic acid. Anagrelide is a selective inhibitor of megakaryocyte differentiation, in particular endoreduplicative activity, but the number of megakaryocytes is not reduced. Using immunohistochemistry, Thiele studied CD61+ megakaryopoiesis in ET before and after anagrelide treatment[55,58,59]. Before therapy, the megakaryocytes in a typical case of ET (platelet count 9.7 × 1011/L) are dispersed and loosely clustered with predominance of large and giant forms (Figure 5). Following anagrelide monotherapy for about 1 year (platelet count near to normal, 4.5 × 1011/L), the number of megakaryocytes is not significantly decreased but there is a prevalence of small forms (Figure 5). This left-shifting of megakaryocyte ploidization and/ differentiation by anagrelide is probably generated by an arrest of endomitotic activity of the disease-specific large to giant megakaryocytes in ET (Figure 5). By this mechanism, anagrelide selectively lowers platelet production without a significant effect of bone marrow erythropoiesis and granulopoiesis, and without an increased risk of myelofibrosis and leukemia. Figure 5 The effect of anagrelide treatment on CD61+ stained megakaryocyte size, proliferation and differentiation in bone marrow biopsies. A: Change of megakaryocyte size from large before treatment (a and b) to small after treatment (c and d) with anagrelide, a selective inhibitor of megakaryocyte differentiation; B: The peculiar phenomenon of megakaryocyte change by anagrelide is generated by an arrest of endomitotic activity of the thrombocythemia-specific reversion of large to small megakaryocytes before and after anagrelide treatment in essential thrombocythemia (ET, left) and in hypercellularfalse ET (early prefibrotic stage chronic idiopathic myelofibrosis, right). Before anagrelide therapy (platelets 9.7 × 1011/L), the megakaryocytes in ET are loosely clustered with predominance of large and giant forms (a, b). After 1 year anagrelide monotherapy (platelets 4.5 × 1011/L), the megakaryocytes are small (c, d), but the number of small megakaryocytes remained increased (d). Originated from Michiels et al. In a historical cohort of 100 ET patients, Cortelazzo et al could distinguish ET patients at low or high risk for major thrombotic complications. Cortelazzo et al did not regard erythromelalgic microvascular disturbances. The idea of high risk factors for thrombosis in ET by Cortelazzo et al in their retrospective study of 100 ET patients (Table 5) should be re-interpreted in view of the Rotterdam experiences on the effectiveness of aspirin for thrombosis prevention in ET (Table 3). In the Bergamo study, the risk for a thrombotic complication is slightly increased at ages younger than 40 years and significantly increased at the age of > 60 years, but the moderately increased thrombotic risk of 6.3% in the age group of 40 to 60 years is not significantly different from the thrombotic risk of 15% in the age group of > 60 years (Table 5). In subsequent large retrospective studies in PV and ET, the incidence of major thrombosis at age above 65 years is much lower (2.3% to 5.1%, Table 5). All well known risk factors for vascular thrombotic disease, such as smoking, hypertension, diabetes and hypercholesterolemia, did not contribute to a further increase of thrombotic complications in ET in this study. The type and number of thrombotic events in 20 of 100 ET patients in this study were 25 arterial events in 17 ET patients (digital ischemia 7, TIAs 15, stroke 0, myocardial infarction 3), seven venous thrombosis events in 3 (superficial thrombophlebitis = erythromelalgia of the skin, femoral DVT in 1) and unusual localization in 3 (Table 5). It is known to me that digital ischemia, TIA and superficial thrombophlebitis (erythromelalgia of the skin) nicely respond to aspirin, thereby reducing the incidence of recurrent minor and major thrombosis to less than 2% per 100 patient-years when low dose aspirin would have been prescribed (Table 3)[61-67]. Therefore, the increased risk of thrombotic incidences in so-called high thrombotic risk ET defined in the Cortelazzo et al study is caused by the increased hypersensitive platelets and its recurrences are related to the underlying platelet thrombophilia in ET. This analysis and statement are supported by detailed and re-interpretation of the data in the Bergamo study in view of the real thrombotic risk in PV and ET in the large retrospective Italian cohorts of PV and ET patients (Table 5). The real incidence of thrombotic risk of regularly treated (good clinical practice at that time) in the large retrospective study at age over 65 years was not 15% but much lower: 5% for PV and 2.3% for ET (Table 5). Consequently, the definition of high thrombotic risk ET by Cortelazzo et al is an overestimation based on statistics mystification derived from one historical cohort of 100 ET patients not on aspirin. The problem of high thrombotic risk as the indication to treat with hydroxyurea has never been evaluated in a prospective outcome study in aspirin treated ET patients. Therefore, this definition of high risk ET does not reflect the reality anymore to which MPD patients nowadays are faced with in the 21th century (Table 3). In our experience, ET at age around and over 65 years without a history of thrombosis and treated with low dose aspirin still remains a low risk ET patient in the absence of vascular risk factors. The presence of one of the risk factors for arterial vascular disease, such as hypertension, hypercholesterolemia, diabetes and smoking, did not contribute in terms of statistical evidence to an additional increased erythromelalgic MIAs in thrombocythemia in three studies[62-65]. Age was not a risk factor for recurrent cerebral ischemic circulation disturbances (including MIAs) in one retrospective study of 187 ET patients and also not in our prospective study of 68 ET patients treated with aspirin. This fits with the observations that increased number of platelets above 350 to 400 × 109/L is the main cause of microvascular events in ET when not on aspirin. Erythromelalgic disturbances and MIAs have never been reported in age adjusted individuals with reactive thrombocytosis. As vascular risk factors usually present at age over 65 years, it surely will contribute to major atherosclerotic complications in the general population and age-adjusted ET and PV patients; consequently, strict measures to reduce and eliminate them is mandatory (Table 6). ET and PV patients with platelet counts above 1000 × 109/L are at high risk for the paradoxical occurrence of thrombotic and bleeding complications. In that situation, aspirin does prevent platelet-mediated thrombotic events but does increase the bleeding tendency (as well as prolongation of the Ivy bleeding times) and, therefore, are candidates for platelet reductive therapy with continuation of low dose aspirin. ET and PV patients with platelet counts above 1000 × 109/L are candidates for screening for acquired von Willebrand disease type 2A. Low dose aspirin surely does increase the risk of bleedings at platelet counts above 1000 × 109/L (Table 6). In our update, low-risk ET patients were younger than 65 years, had no history or manifestations of atherothrombosis or bleeding symptoms and have platelet counts < 1500 × 109/L[60,64,66-69]. Asymptomatic low risk and symptomatic (microvascular event) low risk ET patients with a clear indication of low dose aspirin do not have an indication to reduce the platelet count because of the complete absence of any vascular risk factor and no history of bleeding and atherothrombosis at a platelet count below 1000 × 109/L (Table 6). Ruggeri et al showed that the risk for atherothrombosis in 65 ET patients under the age of 65 with no history of arterial or venous thrombosis and a platelet count < 1500 × 109/L was not increased compared to match control, but 25 of these patients (38%) needed low dose aspirin to control ET-related erythromelalgic microvascular ischemic symptoms. 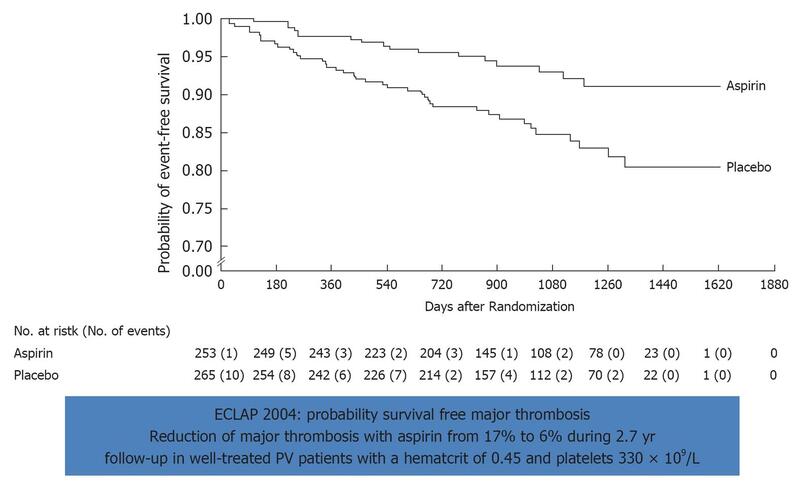 Those ET patients over the age of 65 with no vascular risk factors, asymptomatic while on low dose aspirin, and platelet count below 1000 × 109/L are to be risk stratified as low thrombohemorrhagic risk (Table 6). 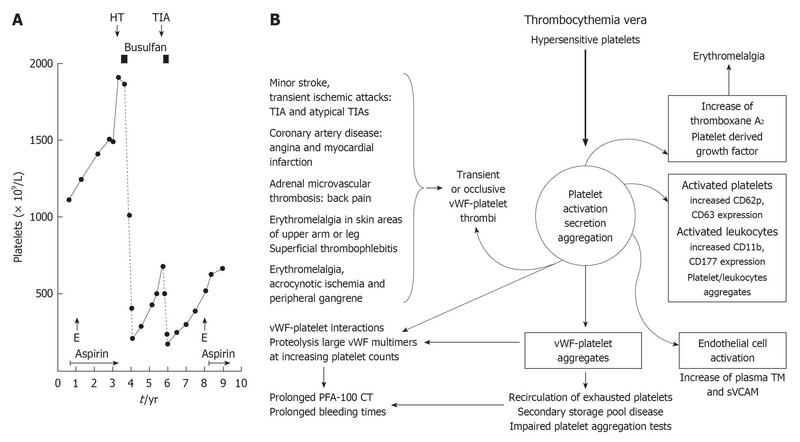 In our experiences, high thrombohemorrhagic risk ET patients do have a clear indication to reduce platelet counts for various reasons, including ET related major thrombosis or bleeding (and documented AVWS), aspirin related side effects, platelet count in excess of 1500 × 109/L, and platelet count in excess of 1000 × 109/L when symptomatic while on treatment with aspirin (Table 6, Figure 6). In case of aspirin side effect (gastritis or aspirin allergy), the reversible platelet COX1 inhibitor indomethacine is the alternative. High thrombohemorrhagic risk ET patients do not necessarily have their platelet count corrected to normal (< 400 × 109/L) but may remain slightly increased (400-600 × 109/L) or even moderately increased (600-800 × 109/L). This near to normal platelet count strategy using one of the non-leukemogenic platelet lowering agents, either anagrelide or pegylated interferon (IFN) α-2a is recommended, provided that low dose aspirin (50 to 75 mg/d or 100 mg 4 times a week) will be continued as long as platelet counts are above 350 × 109/L (Table 6). Table 5 Incidence of thrombosis in polycythemia vera and essential thrombocythemia patients. According to age and previous vascular event in different Italian retrospective polycythemia vera and essential thrombocythemia studies anno 2008. ET: Essential thrombocythemia; PV: Polycythemia vera; NA: Not available. Originated from Landolfi et al. Table 6 Low, intermediate and high thrombohemorrhagic risk stratification of essential thrombocythemia patients and a flexible approach towards therapeutic implications with reference to platelet counts including essential thrombocythemia patients with features of early polycythemia vera in blood and bone marrow (prodromal polycythemia vera). 3Age over 65, platelets < 1000 × 109/L, absence of vascular risk and asymptomatic while on low dose aspirin seems to be no clear indication to reduce platelet to normal (Figure 6). Figure 6 JAK2V617F or MPL515 constitutively activated (hypersensitive) platelets in thrombocythemia spontaneously aggregate and secrete products (platelet derived growth factor et) at high shear stress in the end-arterial cerebral, ocular, coronary and peripheral circulation. This is associated with a broad spectrum of microvascular ischemic circulation disturbances (B) caused by transient von Willebrand factor (vWF)-rich platelet agregates or occlusive vWF-rich platelet thrombi on histological investigation (Figure 1). Circulating activated platelets express increase of platelet membrane surface markers, e.g., CD62p, and circulating platelet aggregates induce endothelial cell activation with increased thrombomoduline (TM) and soluble vascular adhesion molecule (sVCAM) plasma levels (right). Increase of platelet counts from below to far above 1000 × 109/L is associated with platelet-induced proteolysis of large vWF multimers with clinical features of hemorrhagic thrombocythemia (HT, A) due to an acquired von Willebrand disease type 2A [prolonged PFA-110 closure times (CT) and bleeding times]. TIA: Transient cerebral ischemic attack; E: Erythromelalgia. The incidence of thrombotic and hemorrhagic complications in 809 patients with ET from 11 retrospective clinical studies is shown in Table 7. The thrombohemorrhagic complications in 809 ET patients from 11 retrospective studies were recorded in 59%, as thromboembolic complications in 58%, bleeding symptoms in 17%, thromboembolic events without bleeding in 42%, bleeding without thrombosis in 1.4%, and 36% of these 809 ET patients were asymptomatic (Table 7). The incidence of deep venous thrombosis, including portal and splenic vein thrombosis, in this review of retrospective studies was as low as 1% and Budd Chiari syndrome was not recorded (Table 7). The arterial thrombotic manifestations of ET in the 809 patients were described as microcirculatory in 41%, involving the extremities in 24% and the cerebral circulation in 17% (Table 7). The frequency of thrombohemorrhagic complications at presentation of ET varied widely in the 11 retrospective studies: 31% to 83% for minor and major arterial complications and 4% to 38% for bleeding complications. This variation is probably a reflection of the heterogeneity of the patient population studied and differences in the definition of thrombohemorrhagic complications applied. Strikingly, 27% to 70% of the ET patients had developed end-arterial microvascular or functional symptoms reported as acroparesthesias, burning red or blue toes or finger (erythromelalgia), peripheral ischemia, poorly localized neurological symptoms, blurred vision or headache (MIAs, Table 7). Table 7 Platelet count and incidences of thrombotic and hemorrhagic complications in 809 patients with essential thrombocythemia from 11 retrospective studies n (%). ET: Essential thrombocythemia; TIAs: Transient ischemic attacks. Originated from. The second Bergamo study is a prospective randomized clinical trial (RCT) of 114 ET patients comparing hydroxyurea vs placebo. The results show that 2 of 56 high-risk ET patients on hydroxyurea had major thrombotic events (one stroke, one myocardial infarction) and that 14 of 58 high-risk ET patients in the placebo group had thrombotic complications: minor microcirculatory disturbances in 12, major thrombosis in 1, and deep vein thrombosis in 1. Platelet counts were normal or near normal in the hydroxyurea arm, whereas the ET patients in the placebo arm had a mean platelet count of about 1000 × 109/L. In this study, 69% of the placebo group and 70% of the HU-treated ET patients received antiplatelet drugs, aspirin (effective) or ticlopedine (not effective). In this second Bergamo study, 10 of the 14 symptomatic patients in the placebo arm manifested mainly microvascular disturbances and were not on treatment with aspirin. Consequently, this RCT demonstrates that hydroxyurea indeed did reduce the occurrence of microvascular thrombotic events, in particular when not on aspirin. The recommendation from this unbalanced RTC (HU vs placebo) to use hydroxyurea in high thrombotic risk ET as first line treatment for ET seems to us significant over-treatment and potentially leukemogenic. A direct comparison of HU vs low dose aspirin alone in ET patients but with platelet counts below 1000 × 109/L is predicted to be equally effective for the prevention of microvascular circulation disturbances in ET, but the aspirin arm will be associated with increased bleeding events at platelet counts above 1000 × 109/L (Table 3). This has been documented in the prospective 1975-1996 Rotterdam ET study by Van Genderen et al and van Genderen et al of 68 consecutive ET patients who were followed for a total of 419 patient years (Table 3). The 14 ET asymptomatic ET patients in the watch and wait arm suffered from 27 thrombotic and two bleeding episodes which occurred during a follow-up of 127 patient/years. The platelet counts at the time of the thrombotic event were between 410 and 831, mean 610 × 109/L. Only four of the initially 14 asymptomatic ET patients in the watch and wait arm remained asymptomatic after at least 30 person/years follow-up. In the treatment group of low dose aspirin, 5 thrombotic events during a follow-up of 179 patient/years (2.8%). Ten bleeding episodes occurred in ET patients receiving low dose aspirin monotherapy during a follow-up of 139 patients/years (7.2%) at platelet counts between 661 and 3460 (mean 1737) × 109/L, indicating the need for platelet reductive therapy. In patients receiving platelet lowering agents, either busulphan or hydroxyurea and no aspirin, 10 thrombotic complications occurred during follow-up of 40 patient/years (25%) at platelet counts of 624 ± 255 × 109/L, indicating inadequate control of platelet-mediated thrombotic events (platelet thrombophilia) in thrombocythemia (ET, PV). In this study, age over 65 years was not a risk factor for thrombotic recurrences when on low dose aspirin. Personal risk assessment for the proper treatment of each individual ET and PV patient is warranted to improve the quality of life with straight forward treatment recommendations that have no or the lowest risk on side effects with no or the least leukemogenic potential in prefibrotic MPN disease. The implications from the prospective Rotterdam ET study of 68 patients (Table 3) are completely in line with the concept that microcirculatory thrombotic complications (platelet thrombophilia) in ET and in PV in remission by venesection already occur at platelet counts in excess of 400 × 109/L, which are relieved by reduction of platelet counts to normal (< 359 × 109/L) or by control of platelet function with low dose aspirin (50 to 75 mg/d or 100 mg 4 times a week) (Figures 3 and 6)[61,71]. 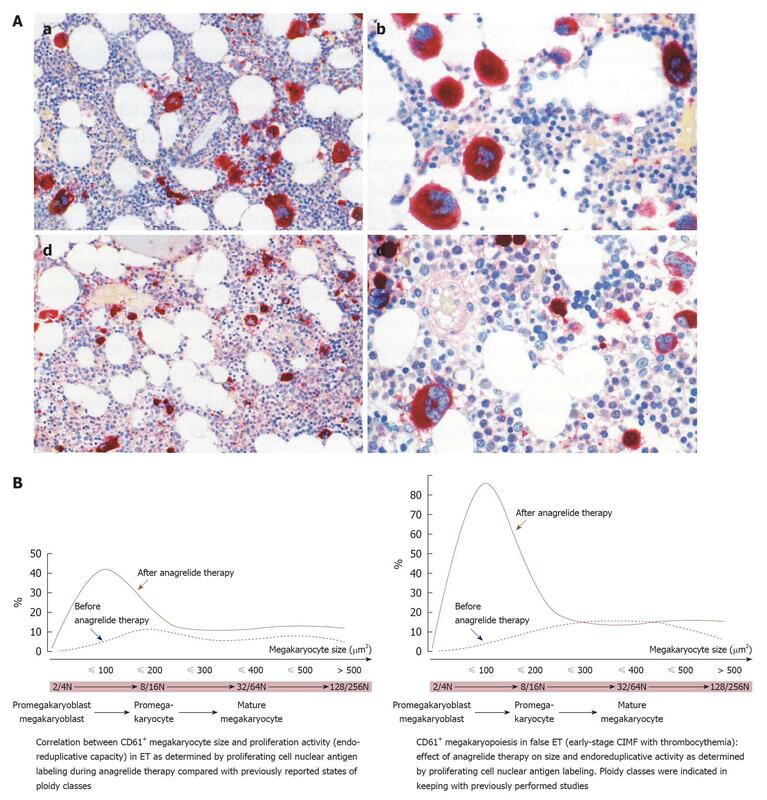 Thrombocythemia of various MPNs with platelet counts between 1000 up to 2500 × 109/L is frequently associated with the paradoxical occurrence of ETT and HT. At platelet counts between 1000 to 2000 × 109/L, low dose aspirin will prevent ETT but aggravates the hemorrhagic tendency of HT, indicating the need to continue aspirin but to reduce platelet count to below 1000 × 109/L, preferentially with anagrelide or pegylated IFN and continuation of aspirin (Table 3)[61,71]. An association between pronounced thrombocythemia in various MPD and an acquired von Willebrand disease type 2A has been increasingly be recognized by and Budde et al[72,73] and van Genderen et al[66,74], implicating that thrombocythemic platelets are also involved in the etiology of the bleeding symptoms (Figure 6). However, the mechanism and pathophysiology of the induction of AVWS type 2A by the increased platelet count is related to increased proteolysis of large vWF multimers. van Genderen et al proposed the hypothesis that the vWF very likely is the link to explain the paradoxical occurrences of both ETT and HT at the same time in one and the same patient. According to this hypothesis, interactive activation of the hypersensitive platelet/ADAMTS13/vWF complex as soon as JAK2V617F or MPL515 mutated hypersensitive platelets enter the circulation will spontaneously aggregate at a high shear stress rate during their first run in the microcirculation. This must occur to understand why both the formation of vWF-rich platelet thrombi formation, as well as increased proteolysis of the vWF at the same time in one and the same patient, does occur at the time of the paradoxical occurrences of both thrombosis and bleeding (Figure 6). It is a matter of the degree of platelet count increase whether erythromelalgic thrombotic, bleeding or both do occur. In addition to the acquired vWF defect (AVWS type 2A), there is a third component of a peculiar bleeding, related to “increased platelet-mediated blood clot retraction” disturbance with erythrocyte fall out, that causes painful subcutaneous hematomas with a central swelling (clot) after a blow, trauma and/or minor or major surgery. This type of bleeding is caused by rapid clot formation of firm clots pulling out the erythrocytes, which in the old literature is known as erythrocyte fall out. This phenomenon is related to increased platelet count around and above 800 × 109/L (Michiels 1981-2012, 16 unpublished cases). In the past, the factors productive of vascular complications in PV were not fully understood. Osler already mentioned that the red painful “neuralgias” of the extremities in cases of PV may simulate erythromelalgia. Oppenheim first recognized that erythromelalgia without evidence of clinically demonstrable vascular occlusion of the extremities may antedate the hypervolemic symptoms of PV. The circulatory disturbances of the extremities in a large series of polycythemic patients were classified as burning painful and ulcerating toes, features of erythromelalgia, acrocyanosis of burning type, ischemic attacks of digital arteries and peripheral gangrene with palpable arterial pulsations[77-81]. This type of vascular complications is completely consistent with the broad spectrum of burning painful ischemic syndrome of thrombocythemia presenting as erythromelalgia and its ischemic complications of painful blue discoloration in the digits leading to gangrene if left untreated. A Swiss study of 86 PV patients (40 men and 46 women, mean age 59 years, observed between 1966 and 1987) nicely demonstrated that migraine-like transient ischemic microvascular disturbances of the cerebral circulation (MIAs, preceded or followed by erythromelalgia) were the main presenting features of PV. The clinical history at time of diagnosis of PV included headache and dizziness in 49%, painful extremities suggestive for erythromelalgia in 42%, AP in the absence of atherosclerotic disease in 9%, bleeding in 11%, pruritus in 16% and asymptomatic in 16%. The clinical findings at time of diagnosis of PV were peripheral microvascular ischemia in 29%, coronary heart disease in 10%, cerebral ischemia in 5% and venous thrombosis in 8%. The presenting thrombotic events in 200 PV patients in the elegant study of Barabas et al published in 1973 were microvascular events, including sudden erythromelalgic ischemia of a toe or finger in 15 with amputation of one or more gangrenous digits in 10 (thrombo-angiitis obliterans), attacks of transient blindness (amaurosis fugax) in 4, MIAs, facial weakness or aphasia in 26, MIA followed by stroke in 6, stroke in 7, femoral artery occlusion in 17, coronary artery disease in 10, superficial thrombophlebitis in 30 (15%), deep vein thrombosis in 26 (13%), splanchnic vein thrombosis in 5 (2.5%) and pulmonary embolism in 4. The clinical features and distribution of arterial thrombotic complications in PV differ from an age-matched population with atherosclerosis without PV. In the atherosclerosis group, males predominate but there is equal gender distribution in PV. Minor and major cerebral artery complications are far more common than coronary artery complications in PV compared with non-polycythemic atherosclerosis patients. The intrinsic blood changes of increase platelets, hematocrit and blood viscosity are responsible for this altered distribution of vascular complications in PV. We studied the effects of bloodletting, coumarin (vitamin K antagonist) and aspirin in great detail in five patients with thrombocythemia associated with classical PV and painful blue and black toe or finger syndrome. Arteriographic studies in 3 cases with erythromelalgic acrocyanosis or peripheral gangrene showed abrupt and complete occlusions of digital arteries (Figure 7). Maintaining the hematocrit below 0.45 by bloodletting alone in this case appeared to be ineffective, but aspirin completely abolished the painful ischemic swelling of the extremities, whereas the digital arteries remained occluded on the arteriogram 1 year later. PV case 4 suffered from a painful big toe, which progressed to acrocyanosis and subsequent black necrosis of the top together with painful bluish discoloration and skin peeling of the second and third toe. Analgesics (paracetamol and pentazocine) and vitamin K antagonists were ineffective. The affected black big toe and red congested second and third toes in this PV patient completely recovered on treatment with aspirin 500 mg per day, which the patient experienced as a miracle. As the patient thought he was cured, he discontinued aspirin and full blown erythromelalgia of the big, 2nd and 3rd toe recurred. With low dose aspirin and control of the PV by phlebotomy he remained asymptomatic for more than 10 years. In case 5 with PV, the erythromelalgic ischemic acrocyanosis was complicated by severe black ischemia of the forefoot despite long-term oral anticoagulation with coumarin. Such a disastrous progression of platelet-mediated erythromelalgic acrocyanotic ischemia of the toes into a black gangrenous forefoot (thromboangiitis obliterans, Figure 7) in the surgical setting resulted in amputation of big and second toes. After adequate control of the PV by aspirin and phlebotomy keeping the hematocrit below 0.45, the patient remained asymptomatic for 9 years and died from lung cancer. 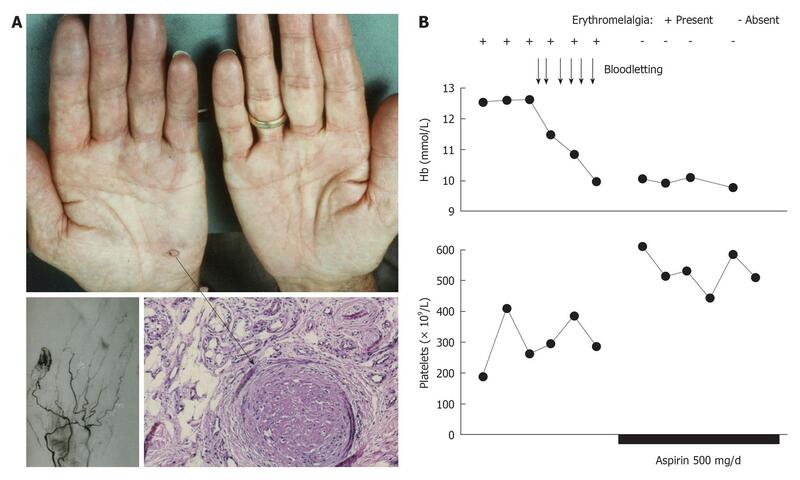 Figure 7 Acrocyanotic ischemic progression in a case of polycythemia vera 6 mo after presentation of erythromelalgia in the fingers of the right hand caused by endthrombotic occlusions of the superficial arterial arcade of the digital arteries. A: A skin biopsy taken from the blue ischemic spot of the handpalm (arrow) showed an occluded arteriole consistent with thrombo-angiitis obliterans; B: The erythromelalgic acrocyanotic congested fingers persited after treatment of polycythemia vera with phlebotomy for 1 mo (4 wk), but treatment with aspirin during a subsequent second month (4 wk) induced complete relief of the painfull blue swelling, which was associated with a significant increase of circulating platelets counts from below to above 400 × 109/L. Four weeks of phlebomotomy treatment (horizontal axis) had no effect on acrocyanotic erythromelalgia of the fingers, and subsequent treatment with aspirin one dose daily for several weeks was associated with the disappearance of painfull acrocyantic erythromelalic sign and symptoms and a significant rise in circulating platelet counts of about 200 × 109/L. Originated from Michiels et al. The London PV Study Group chaired by Weitherley-Mein[84-86] demonstrated that on top of the microvascular disease of thrombocythemia, the incidence of major vascular episodes in PV correlated positively with increased hematocrit levels. Messinezy et al analyzed retrospectively 65 PV patients, who were followed from 1962 to 1983. A mean hematocrit of 0.60 and a mean platelet count of 512 × 109/L at time of diagnosis of PV were associated with microvascular ischemic events and major thrombotic complications in 49% (Table 8). On top of phlebotomy aiming at a hematocrit below 0.48 before 1975 and below 0.45 after 1975, additional low dose busulphan resulted in a mean platelet count around 400 × 109/L and no aspirin was given (Table 8). The follow-up of such 65 treated PV patients for a total of 225 patient-years was associated with the occurrence of 42 vascular events in 23 patients (35%) (Table 8). Vascular thrombotic episodes occurred in 7 at hematocrits below 0.44 and 18 at hematocrits above 0.45. The risk of major vascular episodes at was highest, about 35% to 50% at hematocrits above 0.50, when not on low dose aspirin[86-88]. In personal letters to Weitherley-Mein in 1988 discussing our common experiences of thrombosis and bleeding in ET and PV, The London PV Study Group of Weitherley-Mein[84-86] introduced the Dutch recommendation of low dose aspirin (Michiels et al) for thrombosis prevention in ET and PV[71,88,89]. Table 8 Vascular complications, hematocrit and platelet counts in 65 patients with classical polycythemia vera at time of presentation and during follow-up treatment: results from a retrospective observational study 1985. Study performed from 1962-1983. Phlebotomy to correct hematocrit and busulfan for platelet reduction and not treated with aspirin. Correction of hematocrit in PV to normal by bloodletting plus reduction of platelet count without the use of aspirin does not prevent vascular events. PV: Polycythemia vera; TIA: Transient ischemic attack. Originated from. The European Collaboration on Low Dose Aspirin in PV (ECLAP) study was designed between 1994 and 1997 by Landolfi, Michiels and Patrono within the context of the European Working Group on Myeloproliferative Disorders, a scientific working group of the European Hematology Association founded and chaired by Michiels (1994-2004). The Rotterdam ET study (van Genderen et al) was used for the design of the ECLAP study in 1997[90,91]. Because nearly all PV patients in the United Kingdom and The Netherlands were on low dose aspirin, Pearson and Michiels could not contribute PV patients to the randomized ECLAP study design. The ECLAP consisted of an observational prospective study of treated PV patients already using aspirin and a randomized prospective clinical trial comparing blindly low dose aspirin vs placebo in PV not yet on aspirin to address the question whether low dose aspirin indeed is safe and superior to placebo in preventing erythromelalgia, TIAs, non-fatal myocardial infarctions and stroke and vascular death in treated PV patients, aiming at a hematocrit of less than 0.45 (BIOMED 2 program funded by the European Community)[90,91]. Overall, 1630 PV patients (57% males, median age at recruitment 65 years) were enrolled in the ECLAP study (Table 9). In the observational arm of 1112 of 1630 (68%) PV patients entered into an ongoing, observational prospective cohort study, two third of them had a clear indication for and did use low dose aspirin. Five hundred and eighteen of 1630 (32%) patients in whom the indication of aspirin was uncertain were randomly allocated to aspirin 100 mg/d or placebo in a double blind controlled trial. At the time of data collection, the overall cumulative incidence of cardiovascular events in all 1630 PV patients (follow-up 2.7 years, range 0-5.3 years) was 15.5% for fatal and non-fatal thrombotic events (Table 9) was consistent with 5.5 events/100 persons per year. Age over 65 years and a positive history of thrombosis were the two most important predictors of cardiovascular events. Smoking, hypertension and congestive heart failure were the other significant risk factors for major thrombosis[90,91]. Aspirin therapy was the only variable associated with a lower risk of minor and major thrombosis. Platelet counts and the use of myelosuppressive drugs compared to phlebotomy were not associated with the risk of major cardiovascular events. Table 9 Fatal and non-fatal major thrombosis in 1630 polycythemia vera patients enrolled in the prospective 2004 European Collaboration on Low Dose Aspirin PV studies[90,91]. Data of treated polycythemia vera (PV) patients on aspirin versus not on aspirin are only available for the European Collaboration on Low Dose Aspirin in PV (ECLAP) randomized clinical trial on low dose aspirin vs placebo. PV treatment modalities: 28% phlebotomy only, 26% chemotherapy only, and 35% phlebotomy plus chemotherapy, no phlebotomy and chemotherapy 11% and hydroxyurea was the cytoreductive drug in 79%. Only 518 out of 1630 PV patients in the ECLAP study were allocated to the randomization aspirin 100 mg vs placebo. Treatment modalities at time of randomization were: hydroxyurea in 44%, busulphan in 1%, pipobroman in 5.4%, IFN in 4.2% and phlebotomy alone 28%, or as adjuvant in 72%. There are no differences of vascular risk factors (like hypertension, diabetes, hyperlipidemia, previous thrombosis, etc.) in the aspirin and the placebo group. Mean values in randomized PV patients were 0.45 for hematocrit and 330 × 109/L for platelet count. Treatment with low dose aspirin significantly reduced the overall risk of a combined end point of microvascular and major vascular complications, including cardiac death, non-fatal myocardial infarction and stroke and major venous thrombosis from 15.5% to 6.7% during 2.7 years follow-up. Absolute risk reduction was 8.4% and the number needed to treat to prevent one thrombotic event is 12[90,91]. The rates and relative risk reduction according to primary end points for major thrombosis and for a secondary end point of major thrombosis are shown in Figures 8 and 9. These significant risk reductions in major thrombosis were seen very soon after randomization. Major total and gastro-intestinal bleeding were slightly increased without reaching statistical significance. These ECLAP data indeed confirmed the long-term experiences of the Rotterdam MPD Study Group (1981-1998) that low dose aspirin should be included on top of phlebotomy alone in early stage PV, but also on top of treatment with hydroxyurea in high risk PV patients, even when in remission at a mean hematocrit of 0.45 and mean platelet count of around 300 to 350 × 109/L[5,64,89]. Figure 8 Effect of low dose aspirin on major thrombosis in treated polycythemia vera with bloodletting (40%) or hydrea (60%). 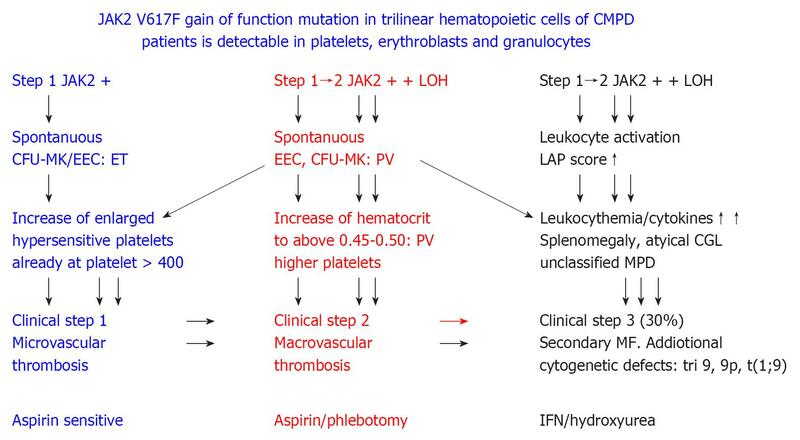 Figure 9 2005 ECMP concept on the molecular etiology of essential thrombocythemia, prodromal and overt polycythemia vera, leukocythemia, platelet-mediated microvascular thrombosis, increased blood volume and secondary myelofibrosis in JAK2 muated classical myeloproliferative disorders. ET: Essential thrombocythemia; PV: Polycythemia vera; LAP: Leukocyte alkaline phosphatase; MPD: Myeloproliferative disorders; IFN: Interferon. Originated from Michiels et al[106,107]. From the results of a few prospective randomized studies in PV (PVSG 01, etc. ), international PVSG experts concluded in 2000 that new clinical trials in previously untreated PV patients should focus on comparing IFN-α, a non-leukemogenic approach, vs a potential leukemogenic myelosuppressive treatment modality. Compared to P32 and pipobroman, hydroxyurea is the least leukemogenic myelosuppressive agent in long-term prospective clinical PV-studies extending observation periods of more than 10 years[93,94]. The rational for using IFN-α as the first-line treatment option in newly diagnosed PV-patients include its effectiveness to abate constitutional symptoms and to induce a complete remission, thereby avoiding phlebotomy, iron deficiency and macrocytosis associated with hydroxyurea[95-99]. IFN-α may prevent myelofibrosis if used early in the early prefibrotic stage of prodromal and overt PV disease. Clinicians will be reluctant to postpone the use of hydroxyurea in early stage PV as long as it is a conservative approach using phlebotomy aiming at a hematocrit below 0.45, on top of low dose aspirin for the control platelet function, and if indicated, anagrelide for the control platelet number is used to keep the PV patient healthy as long as possible. Silver did the pioneer clinical studies and never gave up. Kiladjian et al and Quintás-Cardama et al did the critical studies showing that complete hematological responses (CHR) did occur within one year, and that major molecular responses (MMR) were reached after a follow-up of 2 to 3 years in PV and ET patients (Figure 10). The cumulative incidence of MMR was 14% at 2 years and 30% at 4 years follow-up in the first study. Peglyated IFN α-2a reduced the median JAK2-allele burden from 45% to 5% in 37 PV patients in Kiladjian’s study (Figure 10), and from 64% to 12% in 79 PV and ET patients in the study of Quintás-Cardama et al. Larsen et al[98,99] confirmed the effectiveness of peglyated IFN α-2a in these two studies by the demonstration that a complete molecular response (CMR) may be reached, which was associated with normalization of bone marrow histology (Figure 11). Preliminary animal studies indicate that both hydroxyurea and JAK2 inhibitors are not able to eliminate the JAK2V617F clone in the bone marrow of JAK2V617F mutated animals, whereas pegylated IFN in principle is able to reduce or even eliminate it. However, MPN patients and their physicians should be cautious and attentive not to become too enthusiastic since the use of pegylated IFN α-2a is associated with significant side effects in about one third of PV patients. We do know that only a proportion (30% to 50%) but not all early and intermediate stage PV patients are responsive to IFN. The misconception in the past was to start with too high dosages of IFN. A recent retrospective study of 118 MPN patients with various degrees of MPN disease burden, ranging from PVSG defined ET (n = 46), PV (n = 55) and PMF (n = 17), were comparable with regards to age and peripheral blood features, the JAK2V617F mutation was present in PV 91%, ET 37% and MF 53%, and the spleen palpable (splenomegaly) in PV 25%, ET 13% and MF 47. Data on bone marrow histopathology, circulating CD34 cells, lactate dehydrogenase and mutation load are lacking in this retrospective study. The complete response rate according to ELN criteria was 54% for PV and 63% for ET, but whether they reached complete responses at the bone marrow and molecular level remained elusive. It is known to hematologists that IFN may be rather effective in prefibrotic primary myelofibrosis (PMFMF 0/1) but much less and usually ineffective in advanced WHO defined PMF grade (MF/2/3). It is clearly shown that complete hematological and even significant molecular responses indeed do occur and only are reached 1 to 3 years after initiation of INF (Figure 10). Consequently, a loading dose of IFN seems to us to be useless and starting with low dose pegylated IFN has advances in prefibrotic JAK2V617F mutated prodromal and early stage PV has two advantages: firstly, less side effects and secondly, it offers the unique opportunity to assess the sensitivity of IFN to reduce JAK2V617F mutated cells and MPN disease load in that particular MPN patient. If responsive to low dose peglyated IFN (PegasysR) 45 ucg/wk, and having overcome the eventual initial hurdle of (minor) side effects during the first 6 mo to a year, it is recommended to slowly increase the dose in order to give confidence to the MPN patient that IFN really works better than hydroxyurea in terms of hematological and molecular responses. I have followed this strategy since 2000 in a few early stage PV patients with a previous 10-year history of JAK2V617F mutated ET (manuscript in press). The JAK2V617F mutated prodromal PV and early stage PV, as well as JAK2V617F mutated ET patients with a hypercellular megakaryocytic-granulocytic myeloproliferation (MGM) of the bone marrow (ET.MGM) or prefibrotic PMF as defined by Thiele, are among the candidates for low dose pegylated IFN to postpone the use of hydroxyurea as long as possible. If IFN is not responsive or has been shown to elicit serious side effects, hydroxyurea becomes the second line treatment of choice to treat PV patients, with the aim to improve quality of life by control or reduction of MPN disease burden. In this situation, we should address the question of whether the JAK2 inhibitors as a non-leukemogenic approach is equal or superior to hydroxyurea in overt and advanced PV with a hypercellular bone marrow (80%-100%) at the stage just before the change of reversible benign reticulin fibrosis (RF 0/1 or MF 1) into irreversible reticulin/collagen fibrosis (RCF or MF 2) had occurred. Figure 10 JAK2V617F molecular responses in 38 patients with polycythemia vera during the first three years of treatment with interferon α-2a (Pegasys R) Courtesy of Jean Jacques Kiladjian, France. Figure 11 Bone marrow histomorphology from a patient with early prefibrotic polycythemia vera at diagnosis in 1996 (A) (hemoglobin 19. 7 g/dL, hematoctit 0.60. leukocytes normal, platelets 750 × 109/L, modest splenomegaly, JAKV617F > 54%) just prior to interferon α-2b treatment (B) showing typical hypercellular polycythemia vera pictures with clustered large pleiomorphic megakaryocytes and normal cellular bone marrow with megakaryocytes of normal size and morphology (JAK2V617F < 1%) after 8 years of treatment with interferon α-2b treatment (C). Courtesy of Hans Hasselbalch, Denmark. A and B: Pleiomorphic (normal sized and enlarged ) loosely clustered megakaryocytes with hyperploid nuclei and increased cellularity due to increased erythropoiesis in a case of polycythemia vera (PV) before start of interferon α-2b treatment in 1996; C: Megakaryocytes of normal size and morphology in a normocellular bone marrow in the case of PV (A, B) in complete hematological and molecular remission. Originated from Larsen et al. The discovery of JAK2V617F gain of function mutation by James et al and his team in June 2004, published with significant delay in Nature in 2005, has become a real evolutionary event for a better understanding towards an unifying concept on the molecular etiology for ET and also for the clinical manifestations of platelet-mediated thrombosis, for the increased red cell mass complicated by major and secondary myelofibrosis. JAK2 plays an essential role in hematopoiesis by mediating signals from several hematopoietic cytokines, including EPO, TPO IL-3 G-CSF and GMSCF. The JAK2V617F mutation makes the mutated hematopoietic progenitor cells hypersensitive for TPO, EPO, IL3, G-SCF and GM-CSF, thereby leading to growth advantage of the mutated above the normal trilinear hematopoietic cells in the bone marrow. The discovery of the JAK2V617F mutation by James et al was rapidly confirmed by three groups of multidisciplinary investigators[103-105]. Half of the ET patients and the majority of PV patients have the mutated the JAK2 allele. The JAK2V617F mutation affects the trilinear hematopoietic bone marrow cells and is detectable in platelets, erythroblasts and granulocytes. The gain of function mutation is in line with the concept that all “stops” to blood production in the bone marrow seem to have been pulled out by one factor JAK2V617F causing, due to hypersensitivity of hematopoietic progenitor cells to growth factors, trilinear myeloproliferation. The 2005 concept of Vainchenker, Green and Michiels (France, United Kingdom and The Netherlands) (Figure 9)[106,107] is that heterozygous JAK2V617F mutated hematopoietic progenitor cells may be enough for megakaryocyte proliferation with increase of hypersensitive platelets (ET mimicking PV), with no or slight increase of erythropoiesis (prodromal PV), and that heterozygous/homozygous or homozygous JAK2V617F mutated hematopoietic progenitors cells will produce pronounced trilinear megakaryocyte, erythroid or even granulocytic proliferation with the clinical pictures of PV, granulocytic leukemia, unclassifiable MPD with secondary myelofibrosis. The sequential occurrence of heterozygous and homozygous JAK2V617F mutation can readily explain the spontaneous megakaryocyte and erythroid colony formation (EEC), and the granulocyte precursors growth advantage with the production of increased hypersensitive platelets as a first step in ET (Figure 9) and increased hematocrit as a second step, aggravating the microvascular disturbances of thrombocythemia into the macrovascular complications of PV (Figure 9). Similarly, the sequential occurrence of heterozygous and homozygous JAK2V617F mutation load can readily explain the dual granulocytic megakaryocytic proliferation in prefibrotic and early fibrotic ET with a hypercellular megakaryocytic/granulocytic (ET.MGM) bone marrow associated with constitutively activated leukocytes (increased LAP-score) and granulocythemia followed by secondary myelofibrosis without features of PV because of significant splenomegaly (Figure 9). ET.MGM is clearly in between ET and post-ET myelofibrosis. The association between JAK2V617F mutation load with severity of both MPN disease burden as the cause of trilinear MPN (James et al) and platelet-mediated thrombotic risk (Michiels et al[4,5])[108,109] was already recognized by the bright clinician Dameshek[1,110] as platelet thrombophilia with multiple small peripheral vascular thromboses in patients with trilinear PV. We greatfully thank Dr. Perry JJ Van Genderen, MD, PhD for the significant contributions in the late 1990s in his thesis on Pathophysiology of platelet-mediated thrombosis and bleeding in essential thrombocythemia, Erasmus University Rotterdam 1998[21,22,24,32,35,66,68,71,74].